Knob Style, Single Inlet & Outlet. 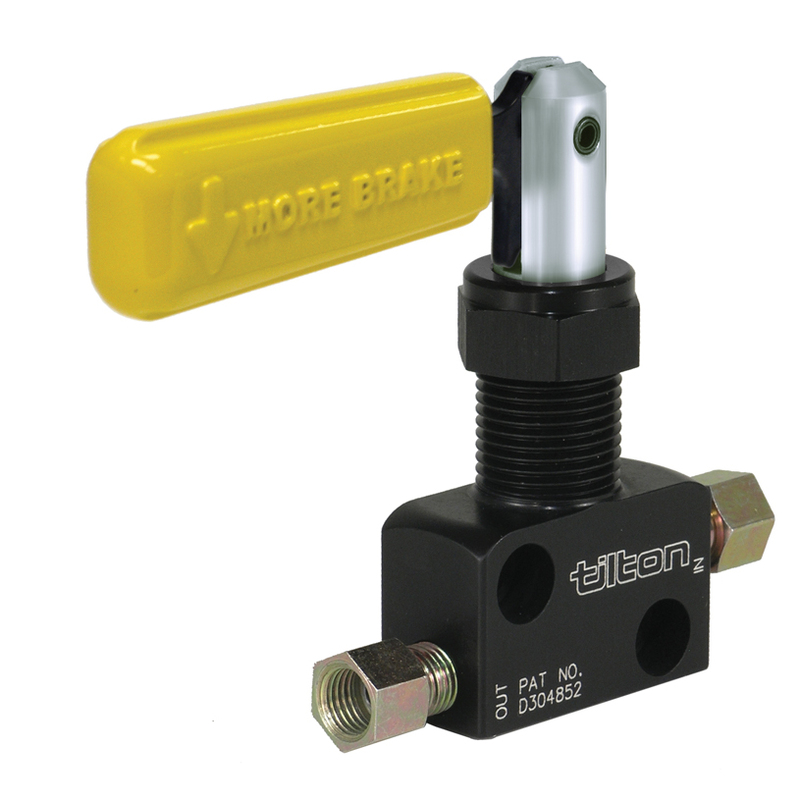 This adjustable proportioning valve combines the latest refinements to deliver precise pressure metering and strength from a compact forged billet design. Pressure adjustments range from 100 - 1000 PSI and provide for a maximum decrease of 57% in front to rear line pressure, the most of any available valve. Adjuster knob with fine thread tuning provides precise pressure adjustment. This adjustment lets you fine tune the front to rear braking balance by proportionally decreasing the rear brake line pressure. Valve weighs only 5.2 ounces and has two .25” side mounting holes. Easy to install as the valves inlet and outlet ports are 3/8-24 SAE inverted flare seats. The Combination Proportioning Valve substantially simplifies mounting, plumbing, wiring and brake proportioning adjustments on vehicles with dual circuit braking systems. The combination block maintains full isolation between front and rear fluid circuits and can be used in conjunction with any tandem outlet or dual mount master cylinder assemblies. 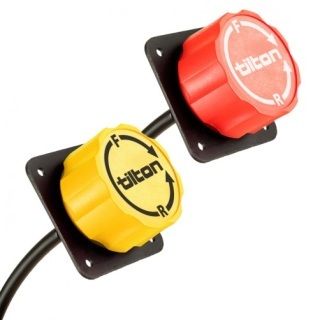 The rear circuit has a single inlet and single outlet with the adjustable proportioning valve. Pressure adjustments range from 100-1000 PSI and provide for a maximum decrease of 57% in front to rear line pressure, the most of any available valve. Adjuster knob with fine thread tuning provides precise pressure adjustment. This adjustment lets you fine tune the front to rear braking balance by proportionally decreasing the rear brake line pressure. The front circuit has a single inlet with two outlets. It can be run as a single outlet with one outlet plugged, or used to split the plumbing on its way to the front brakes. 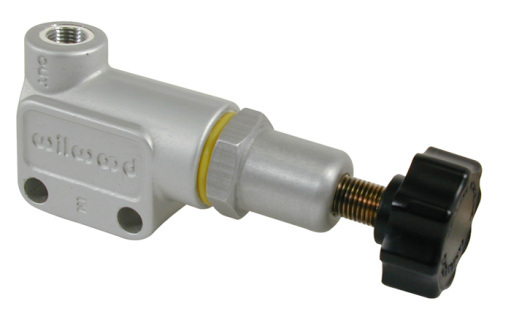 A fluid port with a brake pressure switch responds instantly in the front fluid circuit for brake light activation. A wiring pigtail and a protective boot is included with the kit. 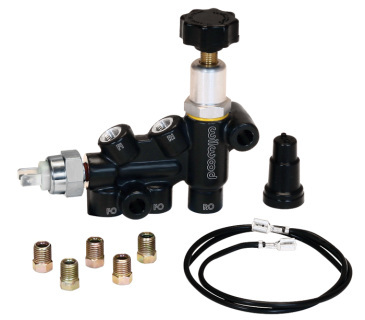 Easy to install as the valves inlet and outlet ports are 3/8-24 SAE inverted flare seats. Tilton lever-type proportioning valves enable adjustable brake line pressure reduction to a particular wheel or wheels. They can also be used effectively with single or dual master cylinder systems, providing better front-to-rear brake balance under both light and heavy braking. Standard remote brake bias adjusters are designed to attach to balance bars and allow brake bias adjustments by the driver during competition.